On October 11, 2018, the Democratic Nominee for Governor in Maryland will be leading a Facebook Live video discussion of his Medicare for All healthcare plan for Maryland. This is a fantastic opportunity to learn more about Medicare for All and support the Jealous campaign at the same time. The more house parties we have, the more voters we reach and the more publicity Ben gets. This is also an opportunity to help down-ballot candidates by inviting them to the event and also by listening to their remarks after Ben’s discussion. The Jealous Campaign, in conjunction with the Blue Wave Maryland Coalition and other Coalition members have joined forces to make this exciting event a reality. You can help make it a success! 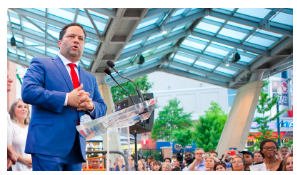 We expect to attract thousands of webcast participants, all interested in learning more about Ben Jealous and his exciting proposals -- but first we need HOSTS!! Bring Ben into your home. This is the defining issue in the campaign and you can help get this message out to voters. Sign up to be a House Party HOST for this exciting event! Click the red 'Host An Event' button at the top right of this page, create an Action Network account, complete a few fields, and your event will be 'on the map' -- one of the 'pins' like you see above. NOTE: If you don't want to create your own Action Network account, but still want to host a House Party, send an email message to houseparties@bluewavemaryland.org with your Name, Address, Maximum Number of Guests, and any Special Instructions [parking, etc] and we'll set it all up for you. As a HOST, all you will need is a good internet connection, somebody with a Facebook account, seats for your invitees and a good way to display the webcast. Once you sign up, you'll receive all the information you need to set up for the event and publicize it. The big day for everyone will be on October 11th, two weeks before Early Voting begins.